Beware of the multitasker. He or she isn’t being honest., for anyone who claims the ability to talk on the phone, surf the web, cook dinner, send a text message, balance the checkbook, and fly a crop duster all at the same time is terribly misguided. He or she might even be suffering from madness. Neuroscientist and MIT professor Earl Miller says, “People can’t multitask very well, and when people say they can, they’re deluding themselves.” What we humans can do, according to Miller, is shift our focus from one thing to the next with astonishing speed. So when we quickly switch from task to task, we think we are simultaneously paying careful and skillful attention to everything around us, but this is a trick of the brain. We are actually hopscotching rapidly between activities. As a test, try to write an in-depth email and have a detailed conversation on the phone at the same time. Or try to study for an algebra test while playing an Xbox game. It’s almost impossible to mix any of these together. The tasks will compete one against the other until the conflicting impulses produce a sort of numb paralysis within the struggling brain. Some researchers have even suggested that if one attempted to work while stoned, he or she would be more efficient than when attempting to focus on too many things at once. And while I wouldn’t suggest keeping a dime bag in your office cubicle, the science makes a compelling case for being a “monotasker” rather than a multitasker. The stupefying effect of multitasking may have been first observed in felines, not humans. Many years ago it was observed that cats could not focus on more than one target at a time. But scientists did not make this breakthrough. Lion tamers did. Thankfully, the lion taming business has fallen on hard times in recent years. After all, such magnificent creatures were never meant to be caged. But some of us still remember the sensational lion tamers of the great circuses. Men like Clyde Beatty and Gunther Gebel-Williams would strut into the steel cage with little more than a costume, a cracking whip in one hand, and a chair in the other. 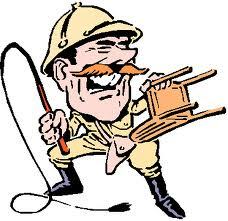 Of course, these big cat masters knew that a dining chair wouldn’t keep the lions from devouring them (nor would the whip). What they knew was that the chair would confuse the lion. The four points of the chair’s legs, bobbing about as they were, tangled the lion’s mind just enough so that the animal could not act on his carnivorous intentions. Lion tamers realized that the big cats could be kept in a catatonic state (no pun intended) by splitting their attention. By focusing on the multiple moving pieces, the lion could never focus solely on the tamer. This multitasking fragmentation kept the lion from being what it really was born to be. It kept the animal, caged. What an apropos parallel for those of us living in a world gone mad with multifarious activity – so appropriate it barely deserves comment. With our jobs, families, careers, hobbies, sports programs, deadlines, doctor appointments, ringing and dinging reminders, news reports, buzzing cellphones, and screaming calendars it’s a wonder any of us remain functional. Our energy is so entirely defused and our attention so thoroughly diverted, that we are essentially incapacitated. With our heads turned down, gazing long and deep into our smart screens, we are at risk of being smashed out of our minds by all the static and interference. We aren’t super-sized computers built and equipped with central processing units. We are human beings, born to laugh and to love; born to take life slowly and deeply as it comes to us; and we are born to be uncaged, set free from the madness of multitasking.